After starting the ODAC season with three losses and one tie, EMU’s softball women came up with a huge sweep on Tuesday, winning two games at Randolph College in Lynchburg. The WildCats had entered the day in first place in the conference with a 4-0 record. The women gave up a big lead in the first game, before coming back for the victory. They combined four hits in the top of the first to jump ahead 3-0. EMU scored two more in the third, both with two outs, to build the edge to 5-0. Randolph scored twice in the bottom of the third, and then took a 6-5 lead with four more in the fourth. The Royals came back in the sixth. The WildCats opened the door with back-to-back errors. Molly Smith (Elkton, Va./Spotswood) singled to tie the game, and Brooke Hensley (Elkton, Va./Spotswood) added a single to put EMU ahead 7-6. Mariah Foltz (Broadway, Va./Broadway) added a two-run single to build the final cushion. Foltz was in the circle for the end of the game, and only allowed a single base runner over the final two innings to lock up the win. The women had 14 hits and took advantage of five Randolph errors. Smith was 3-4 with two runs and two RBIs, while Hensley finished 3-4 with three runs and an RBI. Foltz also had three singles and drove in three runs. 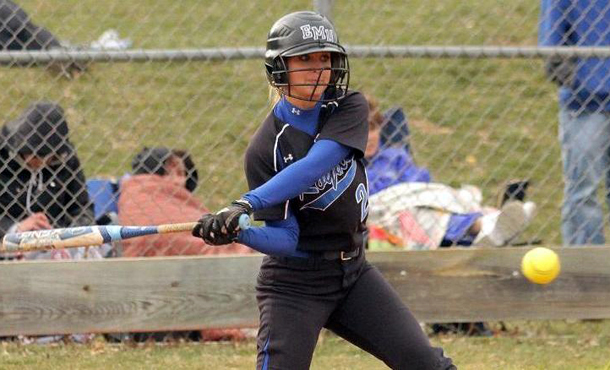 Angelia Miller (Bridgewater, Va./Turner Ashby) added two RBIs. Jordan Aylor (Madison, Va./Madison County) started but gave up six runs in 3.0+ innings. Foltz earned her first collegiate win by spreading three hits over 4.0 scoreless innings. The Royals made a great comeback to force extra innings in the nightcap before winning the game in the eighth. Randolph scored single runs in each of the second and third innings to stake a 2-0 lead. EMU started to get base runners as the game wore on, but couldn’t bring them home, leaving eight on base through six innings. Down to their final at-bat, the women rallied. Jerrica McCallister (Timberville, Va./Broadway) led off with a walk and Brooke Sigrist (Crimora, Va./Fort Defiance) followed with a single. After a strikeout, Smith flew out to center, although it was deep enough that both runners could tag up and stand in scoring position. Hensley came up with the clutch two-out hit, singling to center to bring home both runners and tie the game at 2-2. Foltz send the WildCats down in order in the bottom of the seventh to send the game to extra innings. In the eighth, the Royals quickly scored their runner from second with a one-out single from Aislinn Lucas (Grottoes, Va./Fort Defiance). Casey Racer (Madison, Va./Madison County) followed with a single to bring home Lucas for a 4-2 lead. Randolph got a leadoff double to bring in their placed runner, and then loaded the bases with just one out. But a tapper back to the pitcher turned into a game-ending 1-2-3 double play, giving EMU the 4-3 victory. Hensley finished 3-3 with two RBIs and a run scored. Sigrist and Smith each had two hits. McCallister reached base all four times she came up, getting one single and three walks. Foltz earned her second win of the day by pitching all eight innings, scattering eight hits to improve to 2-1. Eastern Mennonite improves to 7-10-1 with the sweep, including 2-3-1 with their first ODAC wins. The Royals now have a tie on their record after last Thursday’s halted game with Bridgewater was declared a final after a review of ODAC bylaws. That contest was tied at 8-8 after five innings. The women will try to knock the final undefeated ODAC team from their perch tomorrow with two games at Lynchburg College. The Hornets are 2-0 in league play. Start time is 3 p.m.